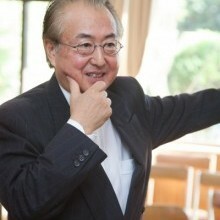 Mr Kazumi Shimodate is the President and Artistic Director of The Shakespeare Company Japan, and also Professor of English and Drama at Tohoku Gakuin University (TGU) in Sendai, in north eastern Japan. He has been a member of the Sherlock Holmes Society of London since 1977; the 1000 Club of Shakespeare's Globe Theatre since 1997 and was appointed Directing Fellow of Shakespeare's Globe Theatre in 2002. Kazumi was born in 1955 and lived in the city of Shiogama in Miyagi prefecture in north eastern Japan. He graduated from the International Christian University in Tokyo (ICU) in 1979 and during his time as an undergraduate he was awarded the first prize in the Tokyo Universities English Drama Contest for directing 'The Picture of Dorian Gray', and between 1976 and 1977 he studied abroad at the University of Exeter in the UK, specialising in English Literature. His M.A. studies were centred on 'The Comparative Study of Shakespeare and Chikamatsu' and completed in 1983. Kazumi undertook a doctoral course at ICU for two years and in 1985 returned to Sendai to teach at TGU. Between 1992 and 1993 he studied Shakespeare at Cambridge University as a Visiting Scholar and during his time there he joined the drama workshops of the Cambridge Experimental Theatre. Since 1994 he has participated in three British Council International Drama Seminars and says he was greatly influenced by Cicily Berry. Kazumi returned to Cambridge University, again as a Visiting Scholar from 2002-03 and whilst there he was deep in the process of creating an original 'Hamlet'. Kazumi founded the Shakespeare Company Japan in 1992 and the following year the associated performing troupe was formed. Kazumi has worked as translator and director for all of the Company's works and their 'Macbeth' was well acclaimed at the Edinburgh Fringe Festival in 2000. He has also directed a Chikamatsu tragedy 'Woman Murderer, Hell of Oil' and joined a production of 'Savage Sensuality' (exploring some of the most passionate sequences in Shakespeare) as Artistic Fellow at Shakespeare's Globe Theatre. Kazumi is also the author of a number of books and articles on Shakespeare, including 'Another Shakespeare in Japan', 'Words and Imagination' and 'The New Globe and Acting'.